Isn’t it amazing how many times we all need to be reminded to be grateful? I know I have to remind my self all the time. As I rush around from the grocery store to the kids’ ballet class to the coffee shop…I rush around and complain how busy and tired I am. Really? Shouldn’t I be grateful? 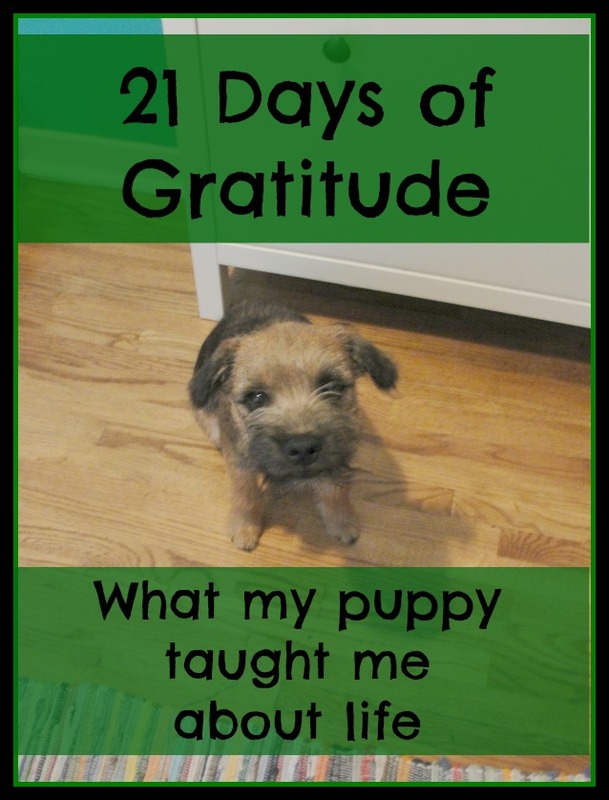 This is why I am so happy to be participating in the 21 Days of Gratitude that is taking place around the web this month. I am glad to have taken the time to stop and focus on the things I am most grateful for in my life. When I was making my mental list of things in my life that I am grateful for the usual things popped into my mind; my kids, my husband, my family and my health. Then, I realized that what I am really grateful for these days is our new dog, Arthur, and specifically our morning walks. I am grateful for Arthur’s eagerness to go outside and explore. Watching him anticipate our walks in the morning always brings a smile to my face. He is always ready to go, go, go. I am grateful for the time that Arthur and I are spending outdoors. Now that my girls are in school full time I am trying to find ways to fit more outdoor play in our lives. I treasure my walks with Arthur. 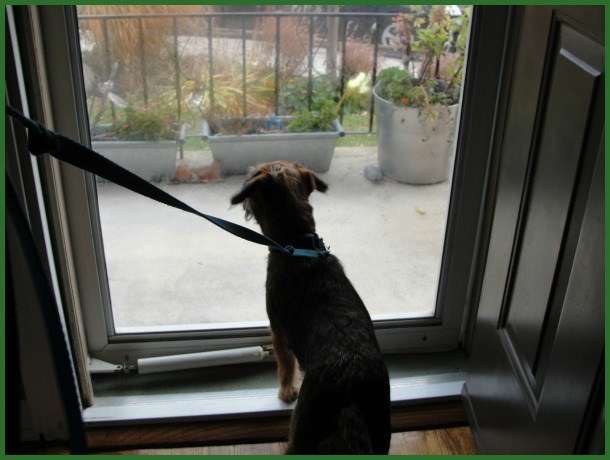 Although, admittedly when we reach the park there isn’t a lot of walking…Arthur spends a lot of time chasing squirrels. Which means that I spend a lot of time laughing at Arthur as he tries and fails to catch those silly squirrels. Joy. I am grateful that Arthur has introduced me to a whole new area of my neighbourhood. I now spend time in the dog park. Not only do I spend time in the dog park, I am meeting new people. I used to know all the kid’s names in the ‘hood and now I know all the dogs’ names in the park. Amazing. Perhaps what I am most grateful for is the quiet I enjoy on our morning adventures. As a mom with two busy girls, there isn’t a lot of quiet in our house. I love being alone and being quiet. Our walks are a peaceful time when I can open my mind and think. As we walk along I can hear the birds in the trees, the leaves crunching underfoot and those pesky squirrels scurrying about. Peace. This one small dog has become the source for such joy for my kids, my husband and myself. He is helping me stay physically active. He is getting us all outdoors. So, I am grateful for this new addition to our family. The love, joy and peace that he brings to us each day. I hope that you will take some time to think about what you are grateful for, you never know where your thoughts might lead you. Please follow this link to Inspired By Family Magazine where you will find the list of all the wonderful blogs that are participating in 21 Days of Gratitude. There are some truly inspiring stories being shared this month. Very sweet. Dogs are amazing. Pinning this. Dogs are wonderful, aren’t they? I love walking with our…or jogging….or just watching them wrestle. I also love their joy when we turn into the woods towards our cottage and they realize where we are, then we let them out of the car and they run straight into the lake for a swim. We feel so lucky! They really do have free spirits that are sort of contagious! Thanks for stopping by. We had to put our dog to sleep last year because of illness and it was really hard on the family. The kids want a new puppy, but with 4 little ones, I’m not sure I’m ready to take on a puppy. Thanks for sharing! What I most certainly have learned is that a puppy is a lot of work. My girls are 6 & 9 years old. They always knew we would not be getting a puppy until they were older. 4 little ones and a puppy sounds like too much work to me. I’m not a real animal person, but we had a little dog till this past February. He was special and we all enjoyed him. He was my kids’ best friend. We had to put him to sleep and it was very, very sad. There is definitely something about a friendship with a dog. I’m sorry to hear about your loss. I’m not a real dog person myself…but their unlimited joy is so wonderful. I bet you look forward to those quiet walks! You are right that the dog walk is a peaceful time. Sometimes I resent that I have to walk the dog because it takes 1 1/2 hour but it’s all in your perspective. I AM always glad for the exercise, outdoor time and faithful companionship of my dog who is blissfully happy to be outside running off leash. I appreciate your post; it puts me in a better more grateful frame of mind! Aww what a sweet post about your dog! And how cute he is chasing those squirrels! 🙂 And what a lovely friendship you guys have.